In the high-speed world of auto racing the MOMO Design brand is highly revered and regarded for its innovative Italian design and outstanding craftsmanship. Founded in 1964 by Italian race car driver Gianpiero Moretti, the brand started out producing premium, high-end accessories for luxury automobiles, including steering wheels, gear shift knobs and alloy wheels, as well as racing suits and helmets for drivers. The brand’s name comes from the first initials of its founder’s last name along with the first two initials of Italian town Monza, where the Formula 1 Italian Grand Prix is annually held. In the 1970’s, MOMO Design accessories were featured on the wheels and steering wheels of Ferrari touring cars and were worn on drivers in Formula 1 competitions. Both Mitsubishi and Subaru used MOMO Design airbag steering wheels on their performance touring cars. More recently, MOMO Design was the official supplier of steering wheels, racing seats, apparel and accessories for the Speedcar Series. 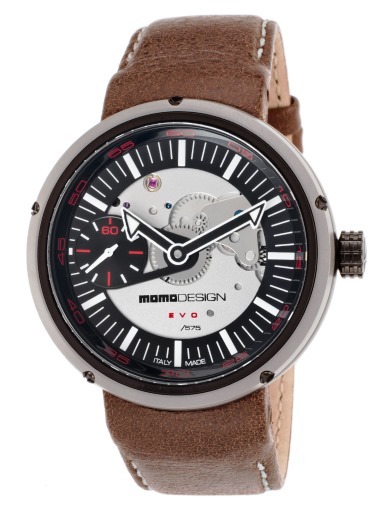 MOMO Design extended its product line in the late 1980’s to include wristwatches, eyewear and writing instruments, featuring such innovative materials as titanium, magnesium and carbon fiber. The brand today remains a driving force in the production of high-end performance cars and related accessories. 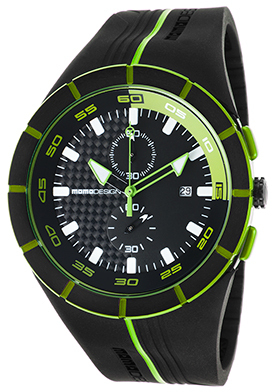 MOMO Design watches are highly sought-after for their avant-garde, cutting edge design and premium craftsmanship by racing enthusiasts and watch collectors alike. 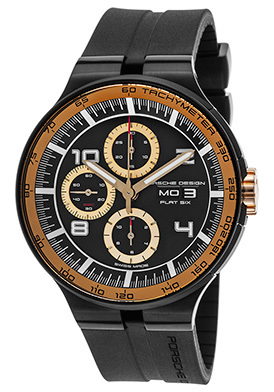 You’ll find an impressive collection of MOMO Design watches for men and women at luxury retailer TheWatchery.com, including styles from the brand’s Evo, Driver Pro, Mirage and Highway collections. 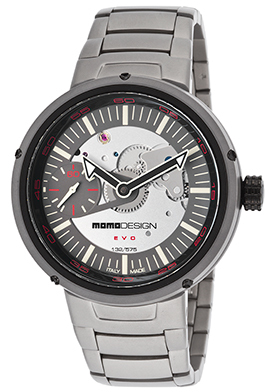 The MOMO Design Evo Limited Edition mechanical watch offers unrelenting precision and design. This vigorous men’s watch has a generously oversized 45mm diameter case and matching bracelet in titanium ion-plated stainless steel. The semi-skeleton dial features open-heart windows, a small-second subdial, luminous hands and baton hour markers. 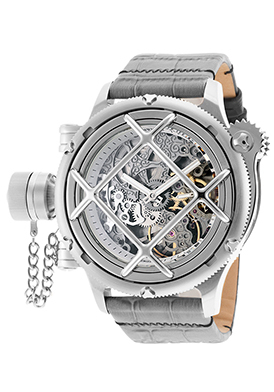 An exhibition case back lets you see the intricate Swiss-made mechanical movement inside. 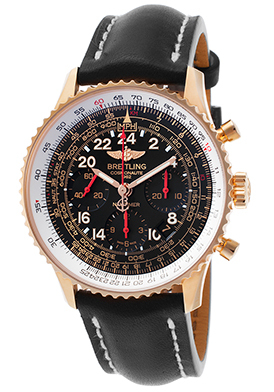 Additional features include a scratch-resistant sapphire crystal above the dial and water-resistance to 50 meters or 166 feet. Complimentary shipping and returns are included on all domestic purchases within the continental United Sates at TheWatchery.com. Let’s face it, many of us purchase a watch based on its exterior aesthetics, magnitude and design. Although luxury watches reflect both an air of prestige and status, they are also an indispensable fashion accessory today for both men and women. The style, size and brand appeal of a timepiece are easily the very first factors we consider when making a watch purchase. Although many of us may take this for granted, the watch movement inside is another aspect we should seriously consider as well. The movement of a watch, which is also known as the calibre is the interior engine that keeps the timepiece operating smoothly and precisely. 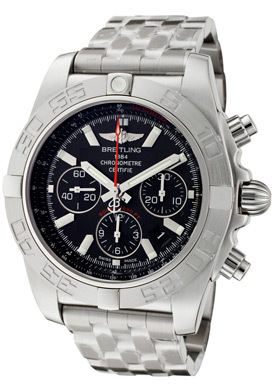 There are three movements to consider when buying a watch: Mechanical, Automatic and Quartz. 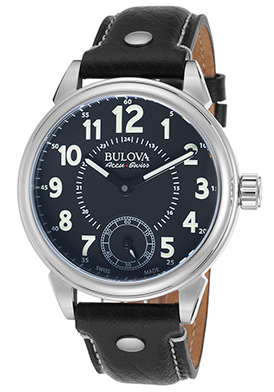 A mechanical movement timepiece features Old-World precision and craftsmanship. It must be wound manually by hand over durations of time to remain operating precisely. Mechanical watches carry a centuries-old heritage of expert watchmaking and are the most costly to produce in regards to their bespoke quality. An automatic watch features precision, self-winding mechanical movement inside and relies on the motion or movement of the wrist to remain operating smoothly. When not in use, an automatic watch will wind down in 10 to 72 hours depending upon the power reserve inside. A watch winder is recommended to keep an automatic watch operating when it is not in use. Quartz movement watches offer the most accurate display of time and are powered by batteries, which have to be replaced about every 12 to 24 months. Quartz timepieces are usually more economical and are also considered a good value. 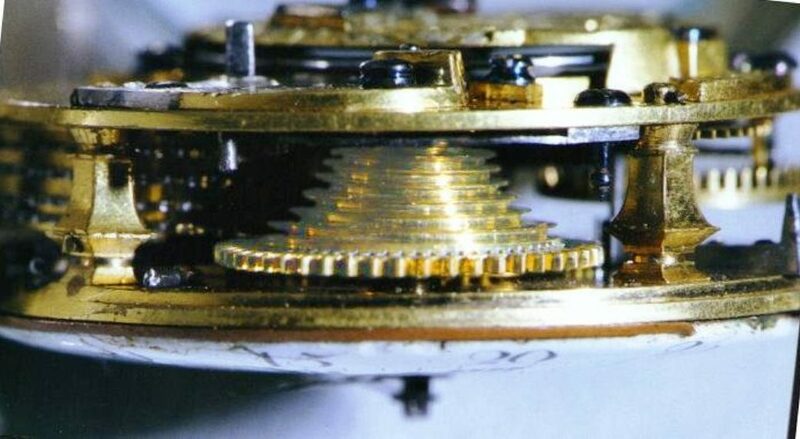 Interestingly, it is very easy to tell the difference between an automatic/mechanical watch and a quartz watch by the movement on the sweeping second hand. Automatic and mechanical watches have a smooth second hand operation that runs continuously in a fluid sweeping movement. Quartz models have a second hand operation with a pulsating repeated starting and stopping motion. 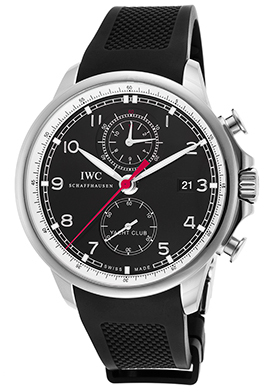 You’ll find many prestigious mechanical, automatic and quartz timepieces for men and women at luxury retailer TheWatchery.com, including styles from today’s most sought-after watchmakers: Cartier, Maurice Lacroix, Breitling, Bvlgari, Omega, TAG Heuer, Ritmo Mundo, Invicta, Gucci, Movado, Jean Richard, Frederique Constant, Swiss Legend, Ebel, Chanel, Oris, Bulova, Maurice Lacroix, Eterna, Versace and Bedat & Co. 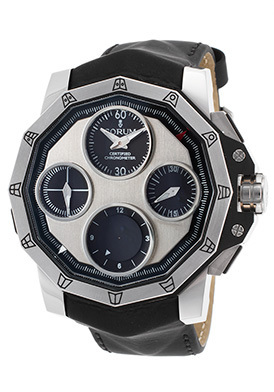 The Invicta Russian Diver men’s timepiece is an excellent mechanical watch choice. 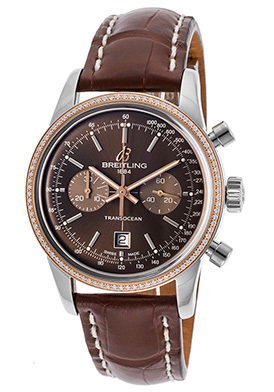 The premium-crafted Swiss-made timepiece has a contoured stainless steel case and handsome gray gator-textured leather strap. A skeleton dial and exhibition caseback lets you view the intricate mechanical movement inside. 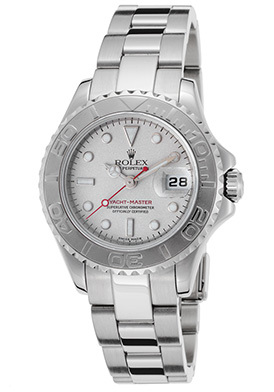 Watch is 53mm in diameter, 22mm thick and is water-resistant to 1,000 meters or 3,300 feet. 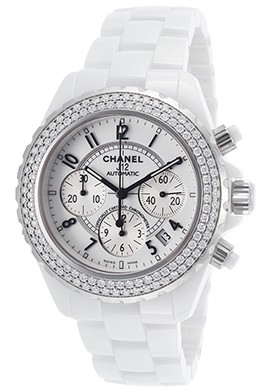 The Chanel J12 White Ceramic Diamond Chronograph is a splendid automatic watch choice for women. 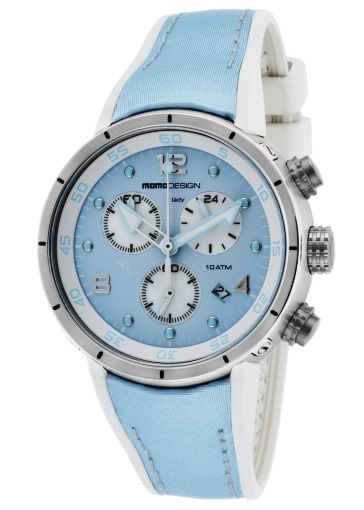 The premium white ceramic case is presented on a matching white ceramic bracelet. 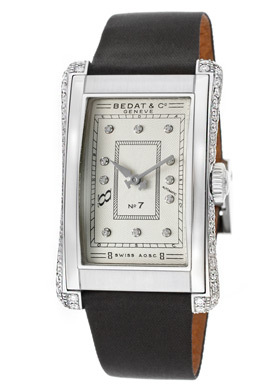 Two rows of shimmering round-cut diamonds dramatically adorn the lustrous stainless steel bezel. 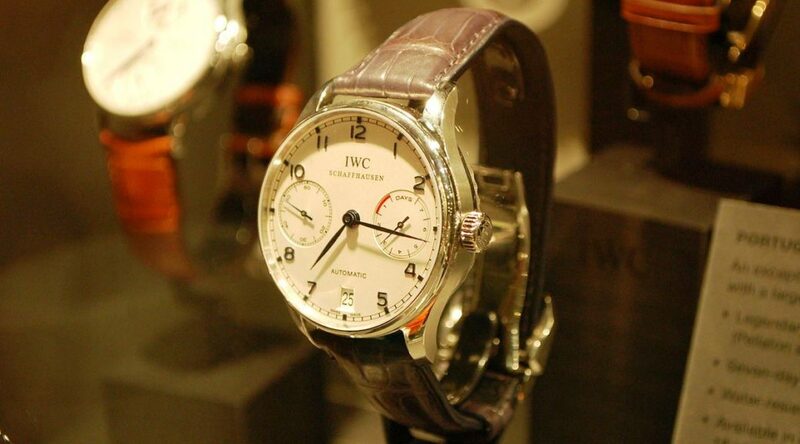 The white dial shines with three subdials, luminous baton hands and Arabic numeral hour markers. 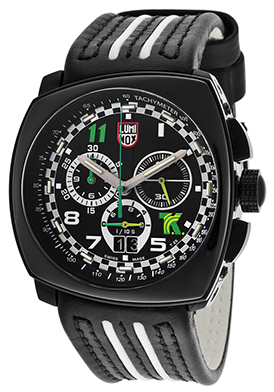 Premium features include Swiss-made automatic movement inside, a scratch-resistant sapphire crystal and water-resistance to 200 meters or 660 feet. 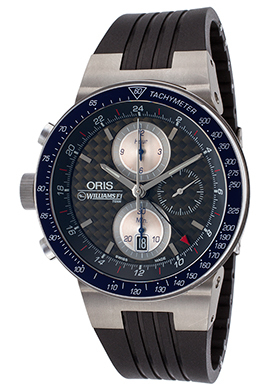 Chronograph is 41mm in diameter and 14mm thick. 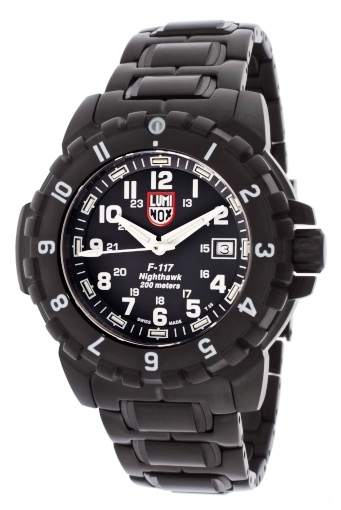 You’re certain to arrive right on time with a Luminox F-117 Nighthawk quartz watch on your wrist. 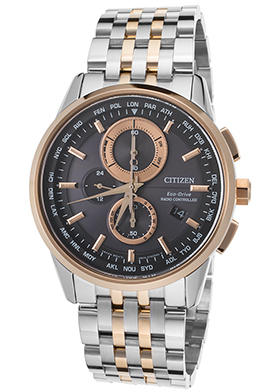 Outstanding men’s timepiece has a bold and masculine black ion-plated stainless steel case and matching bracelet. The black ion-plated steel unidirectional rotating bezel with screened markers encircles the black dial with a backlit outer dial, a date window, luminous sword hands and Arabic numeral hour markers. Features include premium Swiss-made quartz movement, a scratch-resistant sapphire crystal and water-resistance to 200 meters or 660 feet. Watch is 45mm in diameter and 13mm thick.